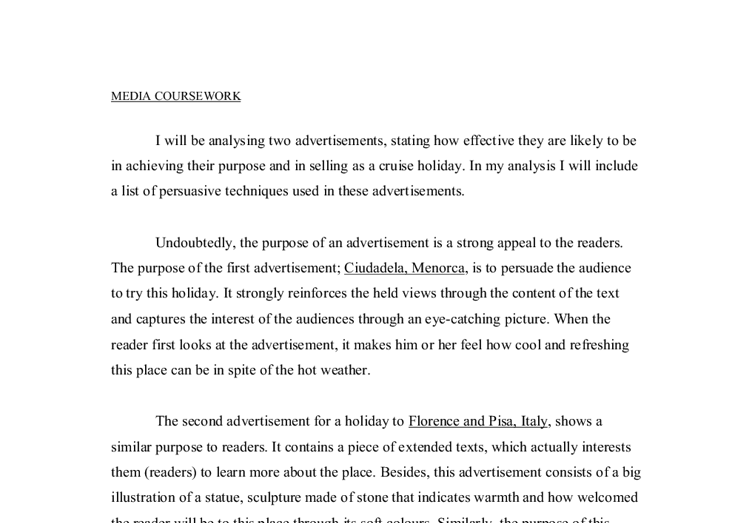 Analysing two advertisements, stating how effective they are likely to be in achieving their purpose and in selling as a cruise holiday. 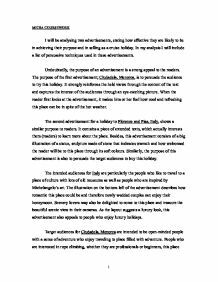 MEDIA COURSEWORK I will be analysing two advertisements, stating how effective they are likely to be in achieving their purpose and in selling as a cruise holiday. In my analysis I will include a list of persuasive techniques used in these advertisements. Undoubtedly, the purpose of an advertisement is a strong appeal to the readers. The purpose of the first advertisement; Ciudadela, Menorca, is to persuade the audience to try this holiday. It strongly reinforces the held views through the content of the text and captures the interest of the audiences through an eye-catching picture. When the reader first looks at the advertisement, it makes him or her feel how cool and refreshing this place can be in spite of the hot weather. The second advertisement for a holiday to Florence and Pisa, Italy, shows a similar purpose to readers. It contains a piece of extended texts, which actually interests them (readers) to learn more about the place. Besides, this advertisement consists of a big illustration of a statue, sculpture made of stone that indicates warmth and how welcomed the reader will be to this place through its soft colours. ...read more. As both the holidays are on cruise, this really intends to attract people who are eager to spend their capital openly. People who like to collect souveniors from different places are also targeted. Both the advertisements contain an interesting form of language. The text contains many positive descriptive words that sound wonderful. For example for Menorca, in the highlights it tells us that it took 50 years to build this cathedral. This tells us how magnificent that cathedral will be to look at. The advertisements also contain alliterations. For example for Italy, "snap up something in silver", or "lap up some luscious local wines". Alliteration makes the advertisement more catchy and memorable. Commands such as, "then go do it now" also exists in the extended texts that make the holiday sound exotic. Repetition is also a common feature used in the adverts. For example, "Art, Art and more art" in the Italy advert. In fact this strengthens the advertisements. The adverts use the informal address as "you". It makes it more personal and emphasises each individual. ...read more. For Menorca, an illustration of the atmosphere of the place is described. The weather is suggested by the blue sky. Blue sky represents calm weather. The reader's main interest and look may be the beaches. Readers may feel that the beaches are attractive and horse-riding is fun. Regardless, of the hot weather, as the girl is sweating, the clear water makes the girl look cool and refreshed. For Italy, the place is represented by an enormous and famous master piece of Michelangelo. This suggests the place is filled with mind blowing architecture and sculptures. The masterpiece is brown in colour and the colour is muted soft, the place appears to be really peaceful along with dark night light shining. This illustration attracts people interested in ancient history. Florence has cathedrals showed by a small illustration on the bottom middle of the advertisement. Cathedrals are also a good form of attraction of the place. How effective are these advertisements? This may vary upon an individual's perspective. These advertisements were quite appealing to me. I imagined myself being there. If I were one of the readers, I would love to be there. It is quite effective for me. ?? ?? ?? ?? 1 ...read more. methods of terrorism. The next image is hard to forget: a clip of a man purchasing a box cutter. The recent attacks in New York and Washington still remind all of us that even pocketknives and box cutters could be used to highjack a commercial airliner. The lighting used is very bright as if it were someone's living room. In the back you can see the light shining through the curtains. The colours used are mostly yellows and pinks, but the man in the background is wearing a green shirt. I picked my three brochures on the differences with in the frameworks. This ensured that pragmatically, semantically and lexically, there would be plenty of literature and comparisons, which I could use as talking points. In the end I selected Club 18-30, First Choice Summer Sun and Thomas Cook Forever Young. They provide help line so that the reader knows there will be help provided if needed whatever time of the week or day. The humour may be intended to discourage the buyers to dwell on the price. The advert has a powerful punchline. A Filipino concept or theme revolves on core or basic Filipino values, ideals, customs, traditions, even idiosyncrasies, and set in a Filipino environment, perhaps in the city or in the countryside, modern or traditional as may relate to the theme. The background consists of a deep dark rich purple colour, the same as the 'Jewels' on the ring. 'Aphrodite was the 'heavenly Greek goddess of beauty and love' and this is a colour associated with love. Therefore both colours convey love and romance. Advert two, the India advert, has a number of images. The main image is towards the top of the page, the image is in a landscape position. The picture is a lake with a boat and the image is taken at sunset this makes the holiday look relaxing. Emotive language: "human crimes" and pronouns: "you" direct the advert at the audience and 'crimes' suggest the reader has done something wrong and should make up for it. They can do so by donating money. Words such as "harpoon" contain connotations which relate to whaling and semantic field; "the gun, the grenade", are associated with war.